Finally, everyday support for minor ACL instabilities for non-contact sports! Everyday ACL Support for Non-Contact Sports! The DonJoy ACL Everyday Knee Brace by DJO represents DonJoy's most comfortable, easiest to use, lightest, patient-ready knee brace and is ideally suited for non-contact sports and activities of daily living. This Donjoy knee brace is perfect for mild ACL/MCL/LCL instabilities, such as with a partial ACL tear, and is designed to provide comfortable support for patients who are non-surgical candidates needing additional support to prevent buckling of the knee with everyday walking activities. This ACL Everyday brace is extremely lightweight at only 15 oz and features a low profile 13" brace length to accomadate people with short leg inseams. This Donjoy brace model is constructed out of aircraft-grade aluminum for a lightweight yet strong design. The Everyday ACL knee brace also has an ergonomic, swooping thigh and calf cuffs designed to provide easy clearance for the non-involved leg with walking activities. This model also has comfortable contoured, flexible cuff shells to conform to any size patient thigh, and Sili-Grip strap pads to enhance proper brace suspension, and to prevent the brace from sliding down the leg. 10 degree soft stops are built into the hinges themselves to reduce impact noise when the knee is quickly extended fully. And like all Donjoy ACL braces, this model also features the patented Four Points of Leverage design to provide exceptional knee support with any type of activity. 4 Points of LeverageTM system pioneered by DonJoy. Sleek, low profile (.080" thick), aesthetically pleasing, aircraft grade aluminum frame. Contoured, flexible cuff shells conform to patient anatomy. Hypoallergenic Sili-Grip strap pads promote brace suspension. 10° soft stops to reduce impact noise. Short brace length (13") accommodates short inseams. 6 month warranty on soft goods. The Four Points of Leverage combine to successfully apply a net differential posterior force, or constant force to the tibia, which reduces the instability in the ACL. Point 1 Anterior: The first point of leverage is the anterior thigh cuff. It acts as a point for rotating the femur anteriorly. Point 2 Posterior: The second point of leverage is the posterior calf cuff. It acts as a point for rotating the tibia posteriorly. Point 3 Posterior: The third point of leverage is a posterior thigh strap, which is applied while drawing the hinge bars posteriorly on the knee. Point 4 Anterior: Incorporating the fourth point generates the crucial opposing force. By tightening and affixing the anterior tibial strap, the hinge is drawn into proper position, and the tibia is rotated posteriorly. Shop our complete selection of knee braces or compression sleeves. For your MCL injury, I would recommend the DONJOY PERFORMANCE BIONIC KNEE BRACE which will give you support and help prevent hyperextension while playing softball. I have a partially torn acl and have knocked knees , I'm looking for a brace for snowboarding. Would this brace work? We would suggest the DonJoy Armor Knee Brace with Fourcepoint Hinge. This provides better ACL support and protection for snowboarding after an ACL tear. Where can I get replacements for the soft paddings and coverings for the ACL Everyday brace? I'm looking for a brace for daily activities only. I've been diagnosed with right lateral meniscus slight tear with a stretched acl. My knee tends to buckle and hyperextend depending on the position I'm in. It causes me severe pain at times. My Dr. Has me in PT to strengthen my surrounding muscles. But the brace I have isn't helping. I was wondering if the DonJoy Everyday is best for me or if you can recommend another one. Thanks. The Don Joy Everyday will provide you with support for the knee with daily activities and will help with the buckling and hyperextension. Can I play football with this brace? How does the knee bend in the braces? Does it have a knee mechanism? 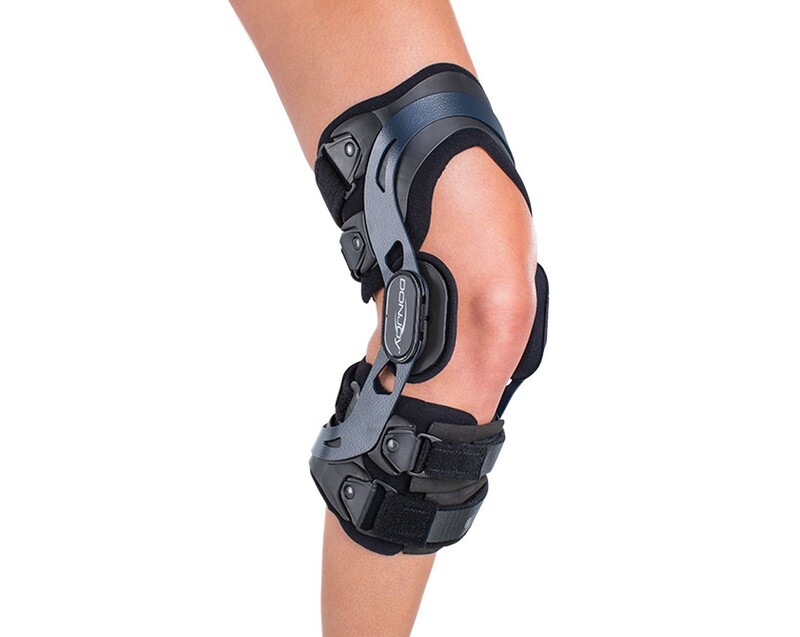 The ACL everyday brace has hinges along the sides of the knee that allow the brace and knee to bend freely. While still supporting the ligament structures. This brace gives me great support and I can wear it all day. My activities include walking the dog and teaching and refereeing volleyball -- lots of standing and walking about a limited space. Pros: The lower portion of the brace fits me fine -- I'm only 5' 5" and it fits great. It's also really light and comfortable. Cons: I need to figure out how to keep the 'sweat' smell out of the padding. I was a pro athlete for many years and had several knee surgeries. I've had expensive braces but most people can't afford an expensive brace, so I've recommended this brace to several people for pre op and post op use. Great for unloading weight and providing serious stability support! Pros: Affordable, Durable, Light, Easy to Use. Cons: No negative feedback from us! I've been in sheet metal for thirty years. Had both knees operated on when i was 16 and in last 2 years I've been having problems with them. Left knee has been giving out and I've tried other braces with no help. Since I got your knee brace, it has stabilized my knee so I can do my job with very little pain. Thank you!